Simply add a photo of your guest of honor and turn these frames into personalized communion party favors that will receive rave reviews! 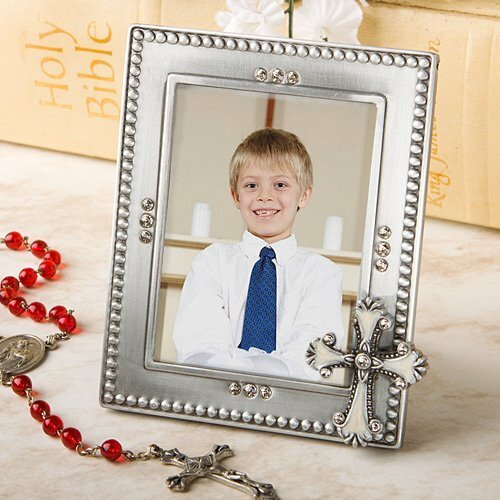 Each 4 1/2" by 3 1/2" metal frame has a pewter finish, beaded border, shimmering rhinestone accents and a dramatic cross charm inlaid with ivory colored enamel in the lower corner. The glass photo opening measures 2 1/2" by 3 1/4" with a hinged slot for easy insertion of a photo or place card. The frame stands with the help of a black felt easel stand back and is packaged in a white gift box. What size picture fits in here? It holds a 2 1/2" by 3 1/4"